Square D occupancy sensors for commercial applications include two new passive infrared (PIR) wall box switch replacement sensors and three new ceiling-mount sensors, including PIR, ultrasonic and dual technology versions. The two new PIR wall switch replacement sensors are both 120/277 Vac and cover a 180-degree area with a 300-square-foot range of minor motion detection. They come in for white and ivory wall mounting and are compatible with magnetic and electronic ballasts. The ceiling-mount sensors are available in three versions: one equipped with PIR sensor technology, another with ultrasonic sensor technology and a third with both PIR and ultrasonic technologies. 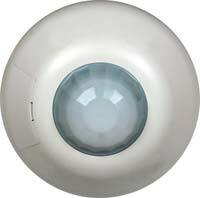 The new PIR and ultrasonic ceiling sensors offer 360-degree coverage and LED motion indicators, and have a coverage area of 1,000 or 2,000 square feet, with adjustable sensitivity settings. The dual technology ceiling-mount sensor offers a 360-degree coverage area with sensitivity adjustment. In addition, it's equipped with dual LED motion indicators - a green LED for ultrasonic motion and a red LED for infrared motion. Its combined detection range is 1,000 square feet in PIR and 2,000 square feet in ultrasonic. The ultrasonic sensor has no blind spots or gaps in the coverage pattern. Power pack units for use with the ceiling-mount sensors are available. A dual-voltage pack comes equipped with a slide switch to select 120 or 277 Vac operation. It has a contact rating of 20A for ballast and 15A for incandescent bulbs. A slave power pack unit also is available to provide switching for additional circuits. The sensor and power pack units are compatible with the Web-enabled company’s Square D Powerlink® G3 3000 level lighting control system. From a standard Web browser, users can changes their system without having to rely on a dedicated workstation running proprietary software. In addition, the sensors can be used in both system and stand-alone applications, so a building can be retrofitted with the sensors without using a Powerlink panel.